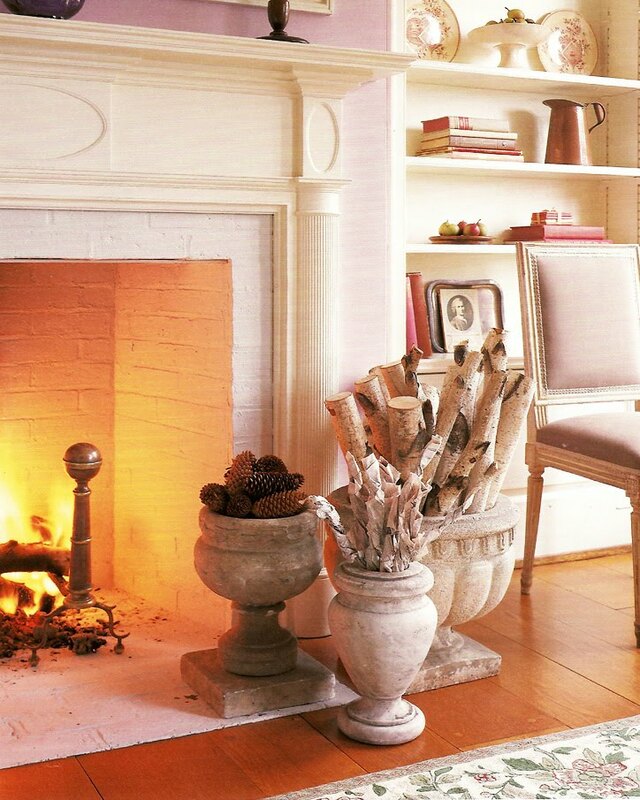 Who among you is lucky enough to have a wood-burning fireplace? Each of the homes I grew up in had one and I have missed them ever since. None of the apartments I have lived in as an adult has had a wood-burning fireplace. They've had mantels and the shells of formerly-functional fireplaces, but none that actually burned wood. There is just something so irreplaceably cozy and homey about a crackling fire, especially in the dead cold of winter. Below are some fireside 'good things' from past issues of Martha Stewart Living that have always impressed me and increased my longing for that hint of wood smoke and that amber glow. This idea was a 'Find of the Month' in February 2000. (Remember that column? I miss it!) The idea was to spare shapely garden urns from spending the winter months in some dark corner of the garage and repurposing them as vessels for fireplace fodder. Here they hold an assortment of kindling, but would be just as attractive standing empty, lending their classical forms to the ambiance of the room. The editors suggest placing felt pads on the bottoms to protect any wood or tile surfaces from scratching. And I loved this gift idea from the November 1999 issue of Martha Stewart Living. It's a basket of fragrant kindling for the hostess with a fireplace or two. 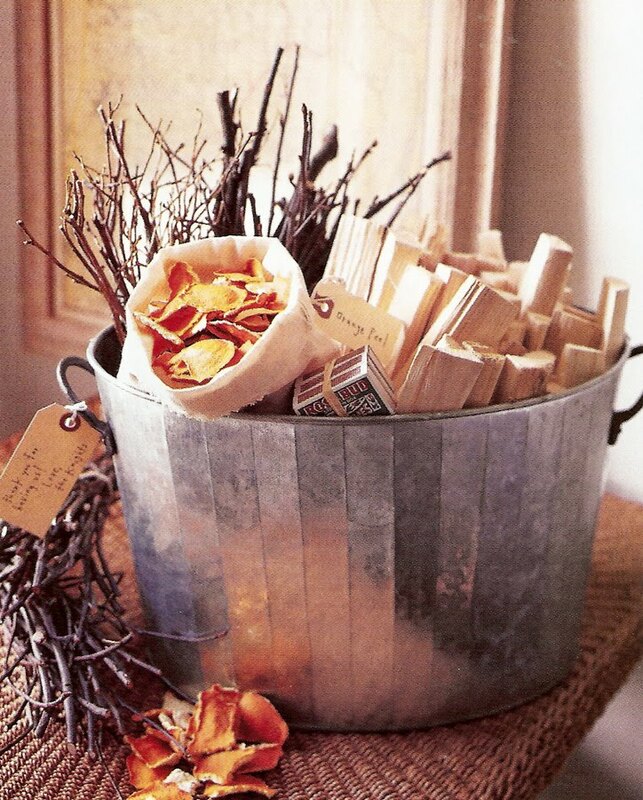 The galvanized bucket holds an assortment of chopped wood and branches from fruit trees, such as applewood. Dried citrus peels add colour to the presentation and will release their subtle citrus scent as they burn. (To dry them, place them on a cookie sheet and put them in the oven on the lowest heat setting for about an hour. Check them often to see how they're drying.) You could also add pinecones and dried angelica. Complete the kit with a beautiful box of matches. I grew up with a wood burning fire place and I sure do miss it. You are so right - nothing compares to a wonderful wood burning fireplace. I live in Michigan so we have pretty cold weather here. I live in an older home with three wood burning fireplaces and two gas fireplaces. There is nothing more cozy than sitting by the fire on a cold evening. I have a fire about 6 days a week, and I am already on my second load of firewood this year. I can relate to your situation. We lived in England for 3 1/2 years without a fireplace. I REALLY MISSED having a warm fire to sit by on those cold, dark winter days. I also have a wood burning fireplace and I would'nt trade it for nothing in the world! It's a great focal point in my living room and fun to decorate.It just keeps the whole room warm in more way than one!